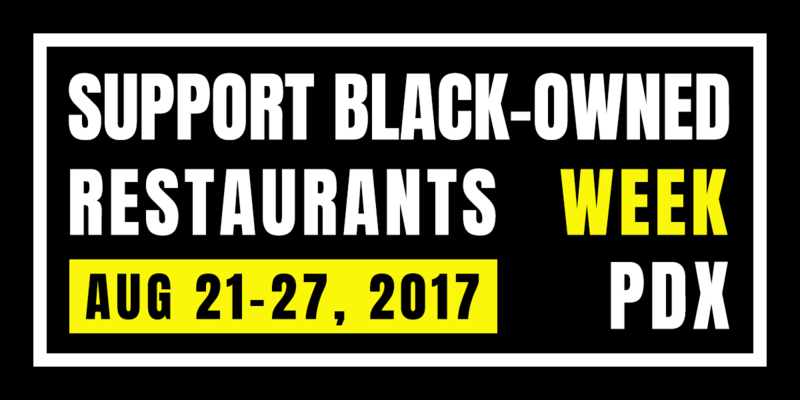 August 21-27 is Support Black Owned Restaurants Week! For the 3rd year in row, we’re featuring Portland’s black-owned eateries. This year, we’ve grown to a full week! With an expanded directory, theme days, specials and a closing night party. How many can you make it to in one week? Please check the eateries’ business hours before heading out, please be patient if there are large crowds, and don’t forget to tip well! Most of all: ENJOY THE DELICIOUSNESS. Monday, Aug. 21 – BLACKOUT solar eclipse specials! Friday, Aug. 25: Entertainment: live jazz at Solae’s Lounge; DJ featuring an evening of pan-African music of multiple genres at Sengatera Ethiopian Restaurant. Bliss House is co-hosting a Sweet Spot Vegan Dessert Lounge event at Best Friend, 1121 SE Division St, Portland, Oregon 97202. Saturday, Aug. 26: Entertainment: live jazz at Solae’s Lounge; DJ featuring an evening of all-Ethiopian music at Sengatera Ethiopian Restaurant.